Copyright © 2012 SciR e s .
tween final exam scores and responses to relevant questions on the post-course survey. “learning by doing” (Schön, 1983). merits has been predominantly descriptive and anecdotal. final examination for the course. previous research regarding role-playing and simulation games. concept of the uncertainty of the outcomes of these processes. 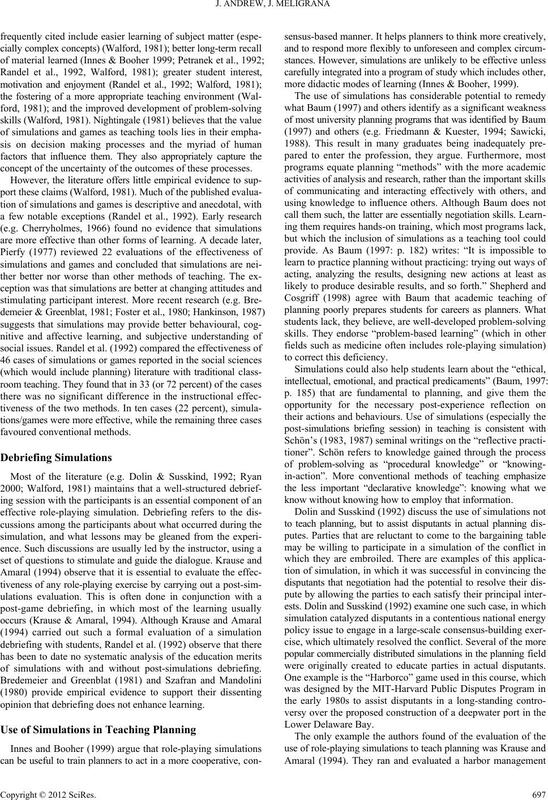 of simulations with and without post-simulations debriefing. opinion that debriefing does not enhance learning. more didactic modes of learning (Innes & Booher, 1999). know without knowing how to employ that information. were originally created to educate parties in actual disputants. correlates well with the amount learned (Petranek et al., 1992). that the simulation had been successful. demic training and the development of a set of behavioural skills. attempte d t o fuse . Harvard University’s Program on Negotiation Clearinghouse. adversarial alternatives to traditional conflict resolution pathw ays. negotiation over the proposed construction of a deepwater port. parties (or roles) in each simulation ranged from two to seven. essentially in i so la ti on. Yes: Negotiating Agreement without Giving in. Copyright © 2012 SciRe s.
the simulations not already covered. 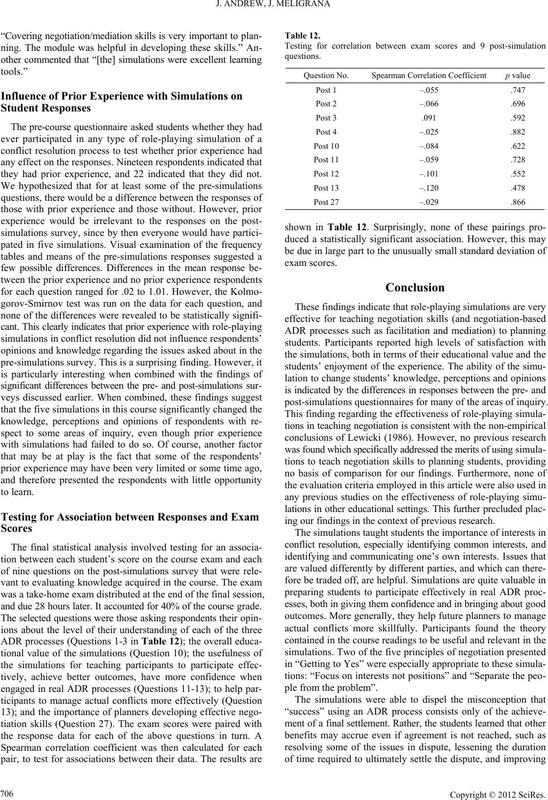 lations questionnaire; and eight to the post-simulations. signed to the first choice, which was also the most positive (e.g. of each set of respondents. exam scores to the other relevant questions (3 above). bly conclude that the two sets of data are statistically different. between course exam scores and relevant survey questions. 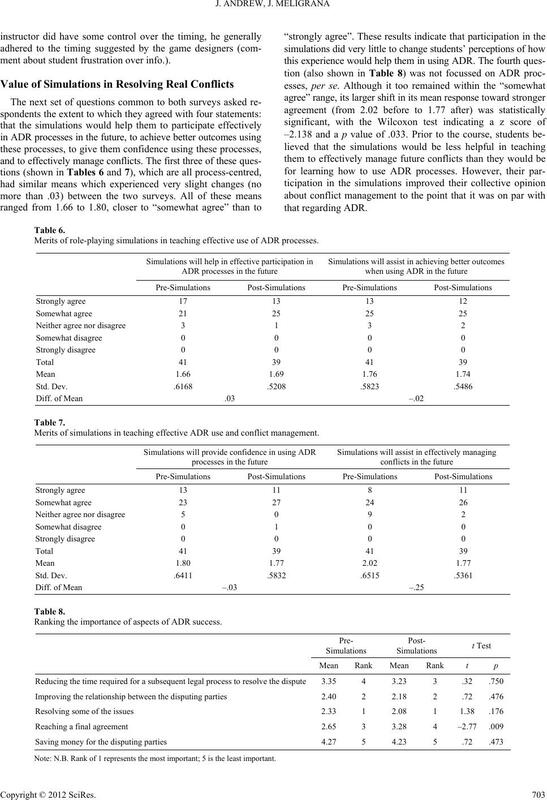 Students’ levels of understanding of ADR processes. understanding of all three conflict resolution processes. the best designed of the five, which meant they ran more smoothly. functioned, and this was reflected in their level of satisfaction. 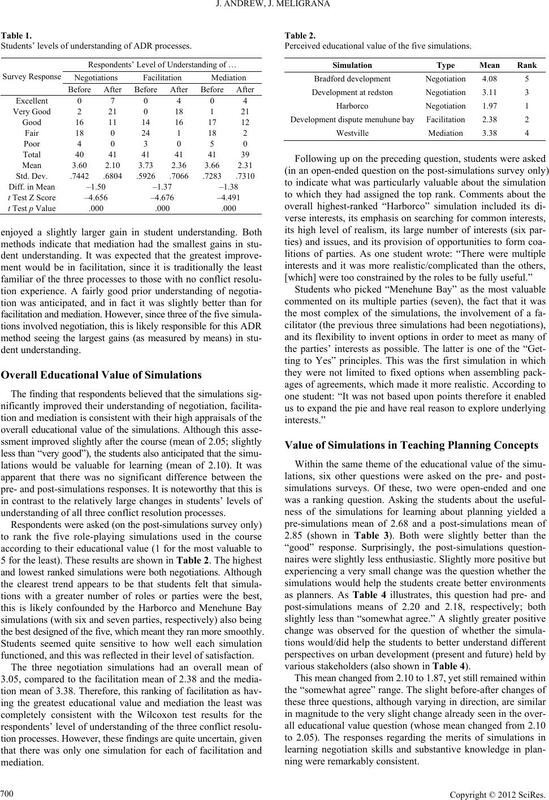 Perceived educational val ue of the five simulations. various stakeholders (also shown in Table 4). Usefulness of the simulations for learning about pl anning. Other merits of role-playing simulations in learning planning. minds about the achievability of planning goals using ADR. ville” mediation dealt with the opening of a homeless shelter. 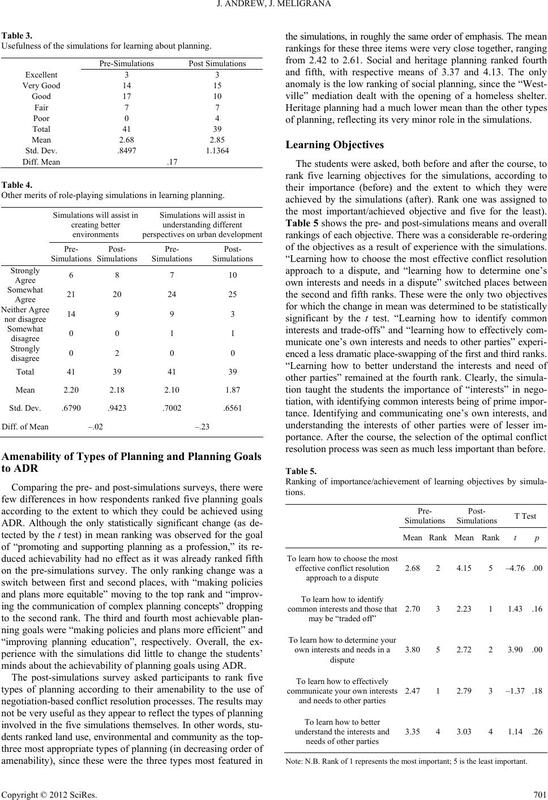 of planning, reflecting its very minor role in the simulations. the most important/achieved objective and five for the least). of the objectives as a result of experience with the simulations. enced a less dramatic place-swapping of the first and third ra nk s.
resolution process was seen as much less important tha n be fore. Note: N.B. Rank of 1 re pr esents t he most important; 5 is the l east important. ing how to put the theory contained in the readings into practice. trust and strong relationships between parties. evitable), the initial set of answers tended to be very general. and listening skills as critically important features. erate creative options that allow trade-offs of interests to be made. on one of the themes of the “Westville” mediation simulation. the flexibility to allow players to “adapt outcomes”. had participated in the five simulations. rated on a five-point scale from far too much to far too little. ment about student frustration over info.). Merits of role-playing simulations in teaching effective use of ADR processes. 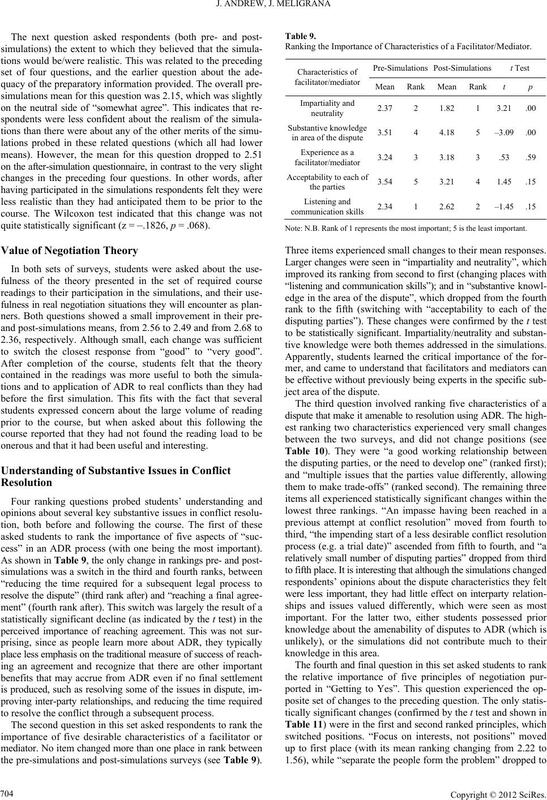 Merits of simulations in teaching effective ADR use and conflict management. Ranking the importance of aspects of ADR su c c e s s .
quite statistically significant (z = –.1826, p = .068). to switch the closest response from “good” to “very good”. onerous and that it had been useful and interesting. cess” in an ADR process (with one being the most important). to resolve the conflict through a subsequent process. 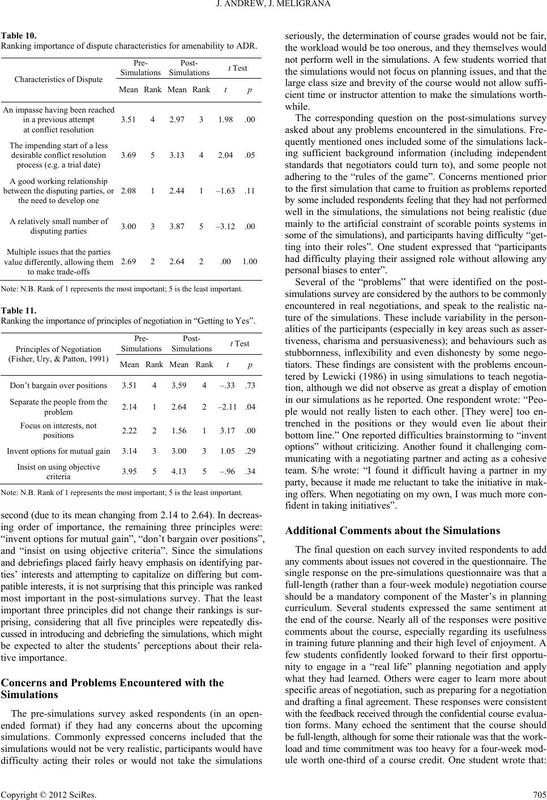 the pre-simulations and post-simulations surveys (see Table 9). Ranking the Importance of Characte ristics of a Facilitator/Mediator. Three items experienced small changes to their mean responses. tive knowledge were both themes addressed in the simulations. ject area of the dispute. Ranking imp ortance of dispute characteristics for amenability to ADR. Ranking the importance of principles of negotiation in “Getting to Yes”. they had prior experience, and 22 indicated that they did not. and due 28 hours later. 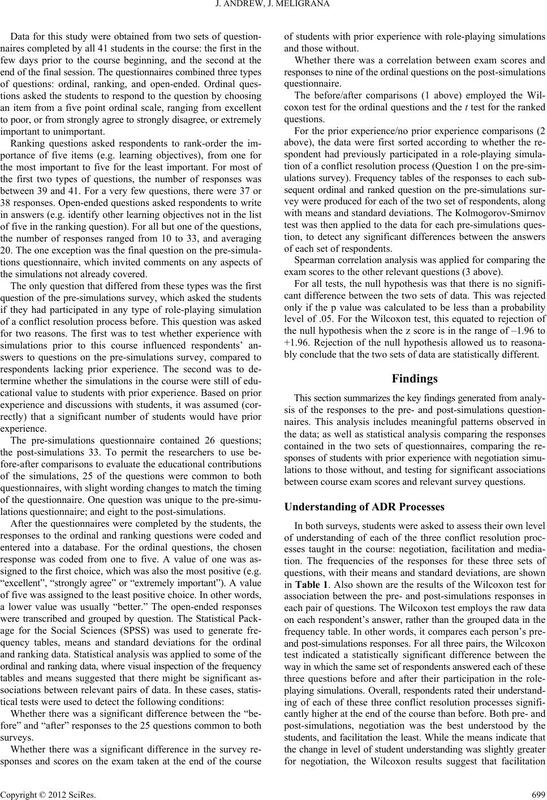 It accounted for 40% of the course g ra d e.
post-simulations questionnaires for many of the areas of inquiry. ing our findings in the context of previous research. revealed. Simulations involving a greater number of parties (e.g. in productive and principled negotiation. between members of negotiating teams. since prior experience with simulations had failed to do so. have any bearing on how they performed on the exam. simulation games. 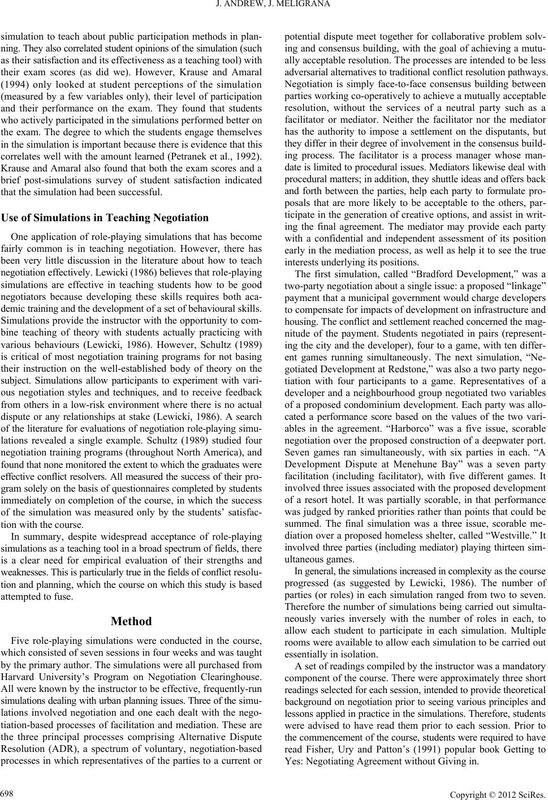 Simulation and Games, 12, 307-331.
rican Behavioral Scientist, 10, 4-7.
agreement without giving in (2nd ed.) . New York, NY: Penguin. education. 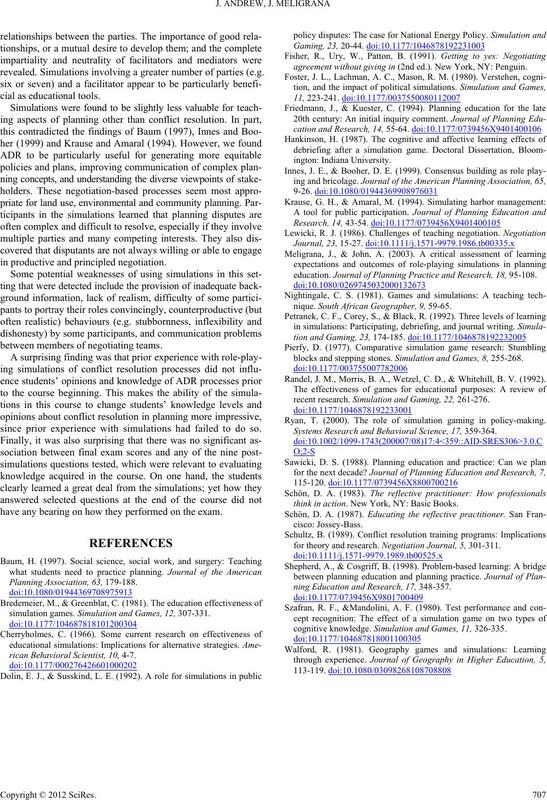 Journal of Planning Practice and Research, 18, 95-108.
nique. South African Geographer, 9, 59-65.
blocks and stepping s t o n e s . Simulation and G a mes, 8, 255-268. Randel, J. M., Morris, B. A., Wetzel, C. D., & Whitehill, B. V. (1992). recent research. Simulation and Gaming, 22, 261-276. Ryan, T. (2000). The role of simulation gaming in policy-making. Systems Research and Behavi o r al Science, 17, 359-364.
think in action. New York, NY: Basic Books. for theory and research. 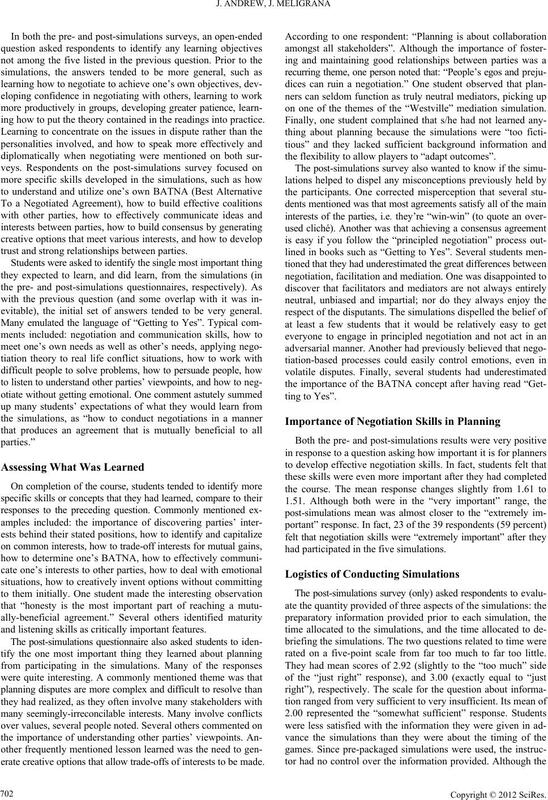 Negotiation Journal, 5, 301-311.
ning Education and Research, 17, 348-357.
cognitive knowledge. Simulation and Game s , 11, 326-335.